This is a series by the author and artist of the Death Note fame. The artwork is of a similar style but the theme and plot are as different as can be. 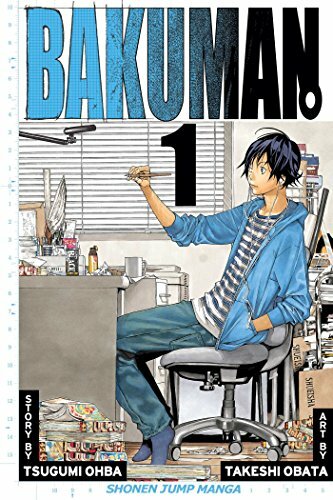 Bakuman is one of my all time favourites. Sent with other goodies as a surprise to a fellow bookcrosser for Holiday Gift Giving 2017. Happy early holidays! This just arrived. Thank you so much! I read some of Death Note back when it was all the rage, but haven't read anything else by the author or artist, so I'm curious to give this a go. This was a very entertaining and memorable read! The plot may not be the world's most unique story, but the engaging characters, precise art, and embrace of the amusing meta humor in writing a manga about writing manga make it fun. I also found the portrayal of the teens here interesting and accurate, illustrating the awkward transition from being a dreaming child to meeting expectations as a working adult. It is quite a bit more thoughtful and mature than Death Note which I appreciated. Sent to the winner of the latest Manga/GN Sweepstakes. Sorry for the delay in getting it to you! An original story , thanks for this discovery.